How to save up to 50%? Rent a villa in Goa and stay together with your group. Enjoy the flexibility, independence and privacy that you will never get in hotels and resorts, because it’s like your own home in Goa. Spread out comfortably. Take a dip in your private swimming pool at midnight. The barbecue, bed, food, and everything else can be just like you want. It’s your vacation, and your own house in Goa. Have it like you wish. Although Goa is mostly related in minds with chalets on the beach in various holiday resorts which belong to the most popular or classic small accommodation properties, these are not the only options. There are many holiday villa rentals in Goa available and that may be the best choice. Especially for those who are looking for more privacy and sort of freedom can be very special. Definitely, if you are traveling as a group of friends or a family, then you should consider this option and plan your villa holidays. Enjoy villa living in Goa. It is exquisite. Luxurious! True, Goa, the beach capital of India offers plenty of accommodation options. But nothing compares to villa living. We know the image of India is scary for some people and if you are not familiar with the conditions and options you may get into unpleasant situations. Therefore, we are ready to provide you useful tips based on years of experience so your stay will be only satisfactory. Here are our tips to renting a holiday villa. What kind of accomodation category you are looking for? Each villa in Goa on rent has its own unique personality… high wooden ceilings, terracotta flooring, verandas or terraces, wide open spaces, objects d’art, and more. Also, the price of luxury villas and apartments will depend on the location, amenities, season, and duration of stay. Each neighborhood in Goa is distinct. There are also differences between North Goa and South Goa. So where do you stay? That depends on what you are looking at. Do you want to spend a lazy Goa vacation by the sea, relaxing and taking in the nature? Or are you keen on enjoying all the fun and water sports? Are you planning to cover most of the attractions, the landmarks and tourist attractions in Goa? Are you visiting Goa for late-night action, the parties, and nightclubs? Do you want to do shopping, get a tattoo perhaps, or a spa or maalish experience? Compared to other Indian states, Goa is like a small dot on the map with the area that can be easily roamed though but still there is always a dilemma for those who need to choose where their holiday paradise will be. This tiny area is divided into North Goa and South Goa and there are some important differences you should consider. North Goa is a perfect choice for (not only) young party lover, descendant of hippies, if you love night life, night markets and if you do not mind more crowds. North Goa is also super famous for amazing flea markets where you can grab awesome souvenirs! This is the place that never sleeps and there is always something you can do if you want. Rent a villa in North Goa if you are with a friends and liberty is what you need. It is not only about partying, though. North Goa has some amazing historical places you can visit – old Goa with popular churches – Bom Jesus Basilica, a UNESCO heritage, Se Cathedral and Francis of Assisi church at one area. And just nearby there are also spice plantations that are getting more popular. There you can pay a visit and let the guides explain the facts on various plants growing there. South Goa, on the other hand, feels less crowded and more relaxing. That does not mean there are no parties. Just less and more clubby, more private and peaceful. The most beautiful beaches are those in the south and if you are on holidays with the family, especially with children then this may be better choice. There are also interesting places to see like Velim Church and Our Lady of Hope church, Cabo de Rama Fort or Mormugao Fort. Southern Goa is also known for dolphin watching opportunities so you should check that as well. In general North Goa is a party place suitable for youth, alternatives and people enjoying nightlife holidays. In fact, the appearance of the northern half of the state is completely heterogeneous, because there is a difference between the resorts of the central part and the villages north of the Chapora River. The closer to the capital, the more civilized and richer the district, the wider the choice of villas in North Goa. There are many popular and beautiful beaches in North Goa but the greatest are these: Baga, Candolim, Anjuna, Calangute, Vagator, Arambol, Ashvem, Sinquerim. All of them have their own specialties. All these are characterized by a developed tourist infrastructure, high level of service and the availability of a rich choice of holiday rentals for every taste and budget. Some beaches are more noisy, some are more crowded, some are more alternative. So it is only up to you where you end up. There are no issues with the accommodation, no matter what you are looking for. There are plenty of cheap budget hotels and chalets, apartments as well as luxury accommodation choices. And of course various types of holiday villas for rent. Arambol Hippie beach. Beach yoga and meditation. Shacks, restaurants. Foreigners selling souvenirs and handicrafts. Anjuna Trance parties. Full-moon parties. Famous flea market. Sunset views. Rocky beach. Less sand. Many shacks on the beach. Ashvem More luxurious. Intimate and stylish. More quiet. Safe for kids/babies to swim. Baga Party beach. Water sports. Many beach shacks and restaurants. Calangute Busy beach. Lots of shops, water sports, shacks, restaurants. Many families with children. Candolim Serene. Long beach. Few people. Shacks and restaurants. Popular with the backpackers. Less people. Close to the Chapora fort. Overlooking red cliffs. Trance and psychedelic parties. Close to Aguada fort. Water sports. Near Taj Hotel. Few people. Compared to North Goa, areas in South Goa are less crowded, more relaxing and peaceful. Although as in the whole Goa, there are parties, too and night life is rich. But still, South Goa is just calmer and more suitable for those who love walks on the beach with less people around and these areas are also considered to be more beautiful when it comes to nature and scenery. Holiday villas in South Goa are more pricey and luxurious. There are many popular beaches but for South Goa we chose Benaulim, Colva, Palolem, Cavelossim and Mobor beaches. Benaulim Few people. Family crowd. More greenery. Water sports. Busy and crowded. Many foreigners. One of the oldest Goan beaches. Palolem Smaller, closed beach. Bit off-road. Great food. Colorful shacks. Cavelossim White sand. Black lava rocks. Relaxing beach. Many shacks, restaurants and hotels. At the meeting point of Arabian Sea and the Sal River. Lovely cafés. Dolphin watching. Oyster catching. Water sports. Modern 4-bedroom villa, located in the residential community. Colva beach — 800 meters. Fascinating European style 3-bedroom villa in gated residential complex. Swimming pool. Cavelossim beach — 400 meters. 1-bedroom family villa. Residential complex. Swimming pool. Choice for families with children. Cavelossim beach — 350 meters. Searching for your holiday villa you will find numerous options and it seems really difficult to do the final choice. Therefore here are few tips on what can be useful when deciding. Reviews – the world of internet makes it easier again; most of the accommodation providers allow placing reviews on their web site and that's what you should check carefully. The satisfaction of customers is crucial and within the references you can often find interesting details and information and assume the reality. Experience – see the years of experience of the owners; more experience means more knowledge. „Oldies“ are trustworthy. Sleeping arrangements and room differences – in India there often happens that even within the same category of the rooms in one property, there may be quite significant differences in size and even facilities included. Check carefully the pictures of all the rooms to see the actual situation and read carefully the information about the sleeping arrangements to see how many beds are there and how many places to sleep are on the couch or otherwise managed, for example in the common areas. Reservation policy – check carefully all the reservation policies along with the cancellation policy, check in and check out policy, the need of refundable deposit etc. Location – in India, distance is taken in different way and then it may happen that the villa location stated does not necessarily have to be really close to the landmark you thought and near the airport can mean 70 km. Know the precise location so you are sure you book the area you want and also so you can check nearby amenities. Seasonal and other discounts – if you are flexible at timing you can make your budget flexible as well; check seasonal and other discounts. You can save the money and even enjoy less crowds and lower prices of services and souvenirs at the same time. Here are ways to save money on your Goa villa rental. Save up to 10% – Book your flight ticket well in advance. The ticket price goes up closer to the departure date. Save up to 15% – Book your villa 3-6 months before arrival. You can ask for additional discounts for early booking, if you book really early. Save up to 5% – Get additional discount if you pay by cash. Save up to 20% – Avail special discounts during the off-season, even in early December, just before the holiday season, or at the end of January, when the peak-season is over. Ask for special discounts for longer stays. 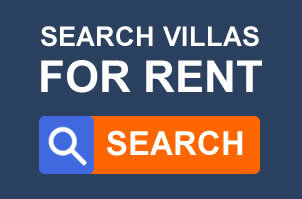 Before renting a villa in Goa you should be convinced that this is the right choice for you. If not, better check the hotels or other accommodation options. For sure, holiday villas are a great choice for larger groups or a family because it gives you significant savings. Generally, the bigger the group, the better price you will get per person. Consider also the facilities and holiday style, as there will be difference between services in a hotel and villa. You will have more freedom in a Goa villa, but there will be things you have to manage on your own. If you want to save money by renting a villa in Goa, check how many people can stay there and also the sleeping arrangements. Check the number of beds, and if you can use other sleeping areas too, such as a sofa. Get more people in to save more money. For instance, we have a villa in Candolim for max 9 people (6 adults and 3 children), with fully equipped kitchen, terrace, air conditioning, free parking and Wi-Fi, and free toiletries for 4,495 INR. This comes to 750 INR per person if we count 6 adults. A hotel in the same area, with same facilities and conditions, will cost significantly more per person. You could be paying around 1,000 INR per person. Always pick up the phone or email to the villa representative before paying, all details should be in writing for your reference in case of any issues. Use the official number listed on the holiday rental site. Think thoroughly what is important for you and check if everything you need is available and especially the additional charges that may be counted. Here are some of the key questions to ask before actual renting a holiday villa in Goa so there are no unpleasant surprises or ruined expectations compared to the reality. What is included in the price? Additional charges? How far is it from the beach, restaurants and supermarket? Is the villa accessible by car or do you have to walk from the closest accessible point? Is it family-friendly, baby friendly? What cooking and other equipment is there? How to reach from the airport or station? Check the pickup options. Do you supply bed linen, towels and toiletries? What are the behavior rules in the villa? Check the policy on loud music at night etc. to avoid problems. When and how do I pick up the keys? Is there a local key holder who can help us when we arrive? Does the place have mobile reception/internet access? Is there a TV or DVD player? Is there space for parking? Is electricity included in the cost? If not, what's a typical weekly bill? Does the owner live nearby, in case of problems? Do you have to make a deposit? Is there a water filter? Or how drinking water is managed? Are the beds doubles or twins? Are there cots if you have babies? If there's a swimming pool, is it currently fit for use? Does it operate throughout the year or is it seasonal? Do you have to share the villa with other guests? There are many ways to pay to book your villa in Goa. Some owners or agents ask for a non-refundable deposit, mostly 25%, with the balance money to be paid later or directly at the villa. You can also book the holiday home without an advance payment. In such cases, check by phone and make sure your reservation is confirmed because there can be system errors. There are other payments options too like directly to the bank account, PayPal, card or others such as Western Union etc. There can be charges if you are paying directly to the bank from another country. So it is better to use a debit or credit card. It is easy, fast and secure. PayPal payment is also a good option. Make sure that the payment is traceable. Insist on payment confirmation always. Alarm bells should ring if you're asked to pay by an instant money transfer service such as Western Union or Cash. While you've no protection when you pay by bank transfer, at least these are usually traceable. If someone asks you to pay by Cash or Western Union, be highly suspicious. Instant money transfer payments cannot be traced at all in a fraud. Scammers will often use this method. Holiday rental websites' guarantees won't cover you if you pay this way. Rated 4.25 / 5 based on 20 reviews.